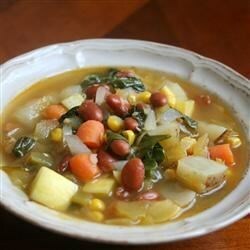 "This very filling stew is a delicious way to use up all those leftover veggies in the fridge. Feel free to adjust the amount of green chiles in the stew according to the level of spiciness you prefer. Serve over cooked rice or with a tortilla." Heat olive oil in a large pot over medium-high heat. Add garlic, onion, carrots, celery, potatoes, chili powder, paprika, salt, and pepper. Cook, stirring occasionally, until potatoes are golden brown, about 10 minutes. Toss yellow squash, spinach leaves, corn, pinto beans, and spaghetti squash into the pot. Continue to stir until spinach leaves have wilted, 1 to 2 minutes. Pour vegetable broth, water, and green chiles into the mixture. If necessary, add more water to make sure vegetables are covered. Bring stew to a boil, then reduce heat to medium low, cover, and simmer until the vegetables are tender, about 45 minutes. See how to make an authentic Mexican pork stew in green tomatillo salsa. yum! This is really different--good with the tortillas!